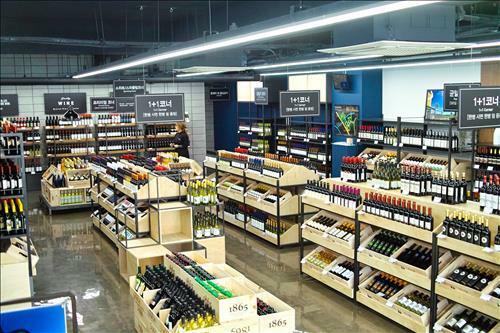 Affordable wine merchant Daily Wine opened its first shop in Uiwang, Gyeonggi Province, on Tuesday. The warehouse wholesaler trades more than 700 kinds of wine for discounted prices of between 5,000 won ($4) and 20,000 won. It is open to individual buyers. Daily Wine said it was able to offer low prices by cutting down on supply costs through direct transactions and bulk orders, as well as using a low-cost suburban location. The closest subway station to the Uiwang shop is the Indeogwon station on Seoul Subway Line 4. Daily Wine currently plans to open five more branches, in the Goyang area, the Gimpo-Ganghwa area, Busan, Daegu and Sejong City.